Another lunch that I made when my mum was visiting for the week (hence the continuing lack of photos), this would have been easy… if the baby hadn’t woken up, deciding she wanted a really long feed… resulting in me leaving the vegetables cooking for too long and burning them slightly. The vegetables that burnt slightly were leek, carrot and potato, which boiled slightly dry. Luckily my mum saved it just in time. I then added sweetcorn, and whizzed together all the vegetables in a blender. I then added a stock cube and some milk before serving up the soup. Had I not nearly burnt the soup, it would have tasted pretty good. It was also a little too thick because a little too much of the water had boiled off. But if I didn’t have a crying, hungry baby, I’d attempt this easy soup again! I don’t have any photos of this, because life started to get a little fraught around this time – my mum came to visit for the week (which is why I made this tatin), then we went on holiday for a week, and then two weeks later we were due to go to California for the summer. So you’ll just have to take my word for it when I tell you that this looked, well, a little odd! It did, however, taste pretty good, and wasn’t too hard to make. I fried up some onions and dark sugar, then removed them from the dish. I then placed tomatoes on the same dish, face down, and poured over the onions and some grated cheddar. I then whisked together 2 eggs and some mustard powder before covering the whole thing in puff pastry. In order to cook it, I then placed the casserole dish in the oven and baked it for 20 minutes. Now, half of the tatin rose VERY high, in a slightly odd manner. Presumably something to do with how I whisked the eggs… either way, it tasted fine and made for a pretty decent lunch! I’ve made these before, back in June of this year in fact. They were a trial run to determine whether or not I was happy to make the same mince pies for Christmas. 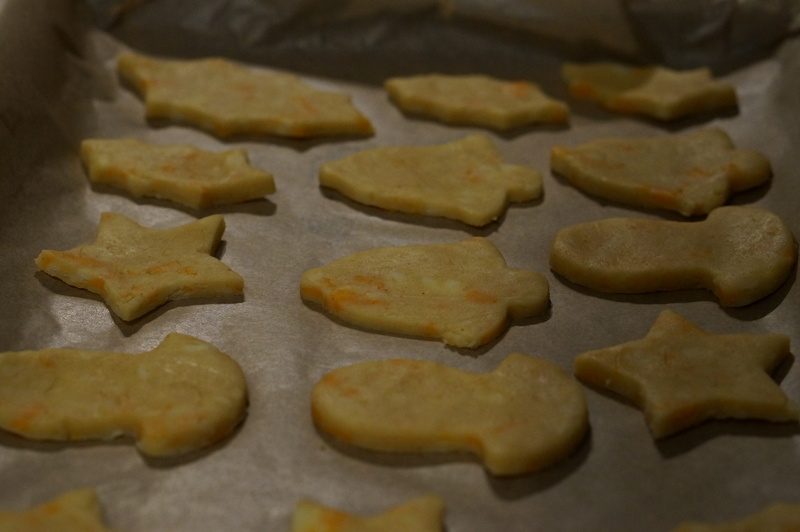 I decided I was, which led to me making them again in November (and then freezing them ready for Christmas). The one difference this time was that, because it was Christmas, I used cranberries instead of a cooking apple for the mincemeat. I like traditional mince pies, but I’m not really a traditionalist, and the only reason I didn’t use fresh cranberries in June is because I couldn’t find any. They’re easier to come by in November. Besides, I prefer the taste of cranberries to that of apple! 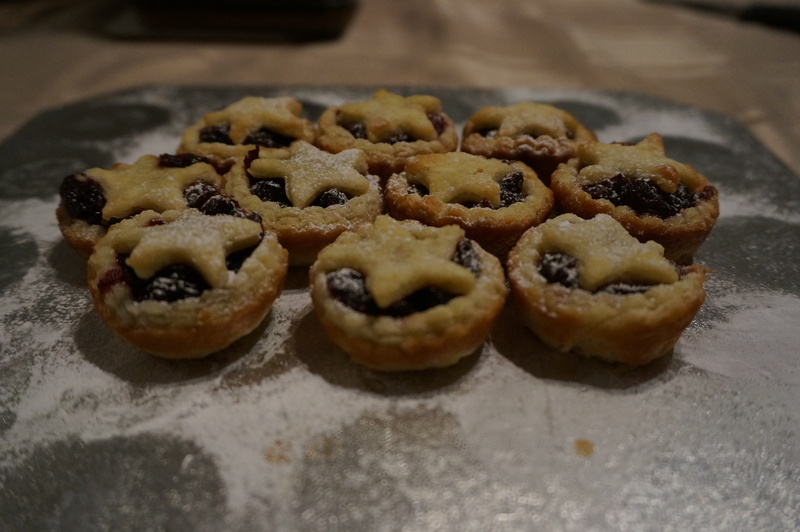 One other note – I actually got less mince pies out of both the pastry and the mincemeat mixture this time. Luckily, it still matched – I managed 24 pies in total. Which worked out well, because I have a 24-piece mini pie tin. So it did make my life quite easy – but it did mean 12 less pies than I had anticipated. The end result was, again, pretty positive – nice and tasty with a hint of Christmas because of the cranberry filling. The tiny size meant that they were also perfect for a small pudding after our Boxing Day dinner, served with either clotted cream or brandy butter (left-over from the Christmas pudding served on Christmas Day). When the rest of us were eating our Christmas turkey, this was my hubby’s alternative. I actually made it about a month in advance, at the end of November, and just reheated it on Christmas Day – if nothing else, it saved on oven space! The recipe itself isn’t too complex, but there are a lot of ingredients – so there’s a lot of grating, zesting and chopping to do before everything goes in the tin. Basically, you mix together nuts, cheese, breadcrumbs, parsley, egg, lemon juice and zest, onion, celery and garlic, then wrap it all in aubergine strips. It is then baked in the oven for about an hour. Nobody except Dan actually ate this on Christmas Day (there was tasty meat on offer, after all), but I did try some a few days later when we were eating up the last of the Christmas dinner left-overs – and it tasted alright. Not like bacon-wrapped chipolatas or turkey tastes, but pretty good if you’re a vegetarian. Another recipe I made in advance of Christmas Day, I’ve never actually made my own stuffing before. My mum always does, but I’ve gone with the (very tasty) shop-bought variety. This year, I had the time, so I thought I’d give it a go. I used Mary Berry’s Christmas Collection recipe for the stuffing and I have to say, it was incredibly easy to make. You boil some onions (yes, I found boiling onions odd too), then add breadcrumbs and sage to the mixture. And that’s it! I froze the stuffing in two halves, so that I could use half of it to stuff the turkey, but still have some left to cook separately for my veggie husband. It turned out OK, although could probably have done with a little longer in the oven. Th stuffing inside the turkey was quite soft and (unsurprisingly I guess) hadn’t crisped off at all. The veggie stuffing was nice and crisp on the outside, but just as soft on the inside as the stuffing that had been inside the turkey. In hindsight, I think using bought stuffing would have been just as good, but I’m glad I gave it a go. I’m not sure I would bother with my own stuffing again – or I would at least try a different recipe (there are some in Nigella Christmas book that I would like to try…). Firstly, I’m gutted that I don’t have a photo of these as they looked amazing.But I guess there’s a bit too much going on on Christmas Day so things like photos of food do get forgotten. I’ll just have to make them again in the not too distant future! Wanting to make a starter for Christmas Day, but not wanting anything too big, I thought that these mini-size tartlets would make a good choice. I decided to make the filo cases in advance and freeze them, topping them up with the duck/ goats cheese mixture on Christmas Day. 1) I put it in our super-fast fan oven. I should have divided the time by at least 10. 2) I use a mini tart-sized tin. Re-reading the recipe, it said to use a mini-muffin tin (so presumably something about 3 times the size of what I actually used). Again, I should have divided the time by at least 10. (although, oddly, the pastry did fit in these tins perfectly…). Having said that, I’m pleased I used smaller tins. I wanted little bite-size starters, not something the size of mince pies. What you don’t need before your Christmas dinner is a large starter! Once I had (begun to) stop feeling quite so grumpy about my burnt efforts, I went ahead and made another batch of pastry cases. This time I put them in the conventional oven for a minute. When I took them out they were a gentle golden brown, just cooked and perfect. These cases were then frozen until a couple of days before Christmas Day, when they were defrosted at room temperature. The filling itself had to be made on Christmas Day, but this wasn’t a great hardship – because it was for a starter I made it when the turkey was just sat in the oven, before things went mental! I fried and sealed the duck, then put it in the oven for 20 mins (it should have been 10, but the oven was only at 160C for the turkey) to cook it through. The duck was then broken up into tiny pieces, and hoisin sauce, small pieces of cucumber and spring onions were added to the filo pastry tartlets. Because Dan is veggie, about half the tartlets had goats cheese added to them instead of duck – but that was the only difference. The filled tartlets were then put in the oven for about 3 minutes before we sat down to eat (as everything else was being taken out), just to warm them through and gently melt the goats cheese. The tartlets were a great success. They tasted lovely, and made for an excellent starter – we had three each, and were all still more than capable of fitting our Christmas dinner in! They may sound like a lot of effort on top of a Christmas Day dinner, but they’re actually quite fun to make and don’t take up too much time when other things need doing in kitchen.